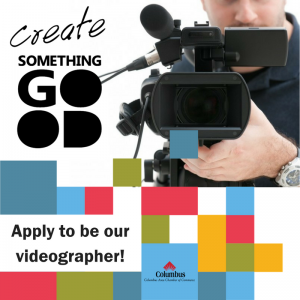 Apply to be the Official Videographer of #SomethingGoodColumbus! The Columbus Area Chamber of Commerce is seeking a videographer for a one-year contract to produce 24 :60 to :90 videos that showcase the area’s best attributes. The videographer will be responsible for filming one new video per month. Additionally the person will be responsible for editing together existing footage for an additional video per month. Assistance with all pre-production including shoot scheduling/casting, script-writing, and audio recording will be handled by the Chamber’s brand committee/Marketing Director. The project is a part of the Something Good campaign which seeks to build community pride and attract new residents to the area. Videos will be utilized on all channels showcasing the Something Good brand, including but not limited to: website, Facebook, Twitter, Instagram, YouTube, email marketing, and cable TV. Total payment is $5,000 for completion of all videos/assignments. Payment will be paid out in quarterly installments based on project completion. Strong preference given to candidates that possess drone knowledge and/or licensing. Additional preference given to candidates who have availability to shoot footage during work week daytime hours — though not required. Applications will be received through Friday, November 17th at 5:00 p.m.
View the Application and Apply Online or print off and drop off application in-person at the Chamber office: 753 33rd Avenue. Download the current schedule of video categories desired to be filmed/edited over the coming year.